applied a frosted glass film on the inside (where the dry goods are stored) and left the top half clear to see my teapots. 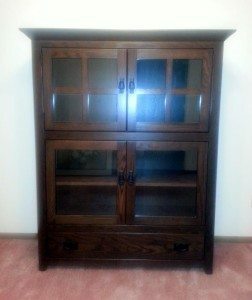 I love this piece of furniture from Amish Originals! Bonnie, we are so glad you like your new bookcase and are impressed how you have made it so functional and decorative!